2014 Harley-Davidson SuperLow 1200T | Throttle Life! Looking for a nimble cruiser? Does such a bike even exist? According to Harley-Davidson it does and it cruises by the name of the SuperLow 1200T. Just announced, the SuperLow 1200T is a Sportster model equipped with essential touring features, the SuperLow 1200T model is designed to get more riders on the long-haul rides of adventure while enjoying the comfort and prestige synonymous with Harley-Davidson. In creating the SuperLow 1200T, Harley-Davidson has for the first time combined its nimble SuperLow chassis with the performance of an Evolution® 1200 V-Twin engine. A new suspension and tire package is ready to go the distance with luggage and a passenger on board. Its ergonomics are calibrated to offer riders from 5’ 1” to 5’ 7” in height an easy reach to the ground, handlebar and foot controls. The SuperLow 1200T weighs 118 pounds less than the lightest Harley-Davidson Big Twin touring motorcycle. Touring features of the SuperLow 1200T include locking saddlebags and a detachable windshield. The saddlebag mounting hardware incorporates quick-detachable docking points to make it possible to easily add an accessory rack or backrest. The rear shock absorbers offer easy pre-load adjustment to accommodate the weight of luggage and a passenger on the two-up Reduced Reach® touring seat. Mini footboards provide added comfort for the rider and passenger, and the rider foot position is three inches forward from the SuperLow® 883 model to make it easier to place feet flat on the ground and to reach the side stand. An air-cooled Evolution® 1200cc V-Twin engine with Electronic Sequential Port Fuel Injection (ESPFI), rated at 71 ft. lbs. peak torque at 3500 rpm, has a broad powerband for easy get-away from a stop and smooth power out of corners. The powertrain is finished in black powder coat with chrome-plated covers. Reduced Reach® two-up touring seat moves the rider forward and features a narrow nose for an easy reach to the ground. Seat height is 26.1 inches. Rear suspension features a right-side twin tube and a left-side dial adjustable emulsion shock with an easy-to-reach dial that enables a broad range of pre-load adjustment without removing the saddlebags or using tools. Front suspension is tuned to accommodate touring and passenger payloads while providing a comfortable ride. Detachable 14-inch clear polycarbonate windshield can be adjusted on the forks to match rider height. Optimized rider foot location allows easy reach to the ground and to the side stand. Mini footboards provide support to the rider for comfort on long rides. Black and silver, split five-spoke aluminum wheels with Michelin® Scorcher™ 11T touring tires that are engineered for a touring payload. Front turn signals are located on the lower triple tree to increase handlebar adjustment range. Lockable saddlebags are covered in durable black vinyl with chrome badges. Factory-installed rear docking hardware facilitates installation of an optional luggage rack and sissy bar with backrest. Premium glass-filled chrome cloisonné tank badge. Chrome-plated headlamp visor, turn signal housings and instrument housing. Color choices include: Vivid Black, Candy Orange, and two-tone Birch White/Midnight Pearl. 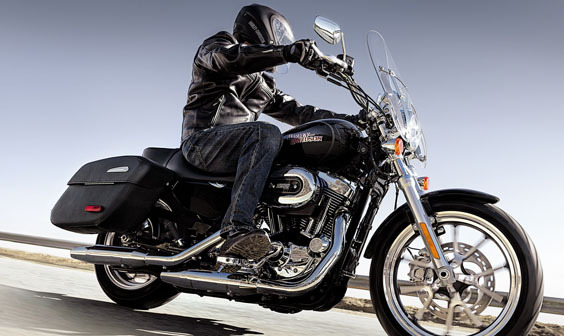 The SuperLow 1200T is available now as a mid-year 2014 model introduction and on it’s way to your local dealerhip.